One hundred and one things to do in and around Pine Gables Cabins! In every cabin you will find the "Pine Gables Adventure Book" full of maps, menus, brochures, hiking trails, and other area information. Explore beautiful Lake Lure in one of our canoes. Fish at our three private fishing ponds or at the dock on Lake Lure. Explore Pine Gables' natural landscape and its diverse flora and fauna. Relax at the lakeside dock. Dining out: From hot dogs to fine dining, there are many locally-owned restaurants. Enjoy romantic candlelit dinners by the lake, fine dining with incredible views, pubs and grilles, BBQ, Italian, Mexican & "down-home" on the river .. we have it all! Play tennis a the tennis courts at the Lake Lure Municipal Building (near the Lake Lure Marina). Less than a mile walk from Pine Gables. The Lake Lure Municipal nine-hole golf course. The Lake Lure Shag Club! If that's not enough, here are places to go within 70 miles. And if you�re a baseball fan, a visit with the Forest City Owls is always a fun excursion the whole family can enjoy! The Forest City Owls Baseball Club is a proud member of the Coastal Plain League. So plan a night out at the park, we'll probably be there too. View their schedule by Clicking Here. Or for more information contact the Owls at 828-245-0000. Crooked Creek Golf Club, Inc. Experience the zipline canopy tour called �one of the best in the nation!� in USA TODAY. Just 20 minutes from Asheville, Navitat is a world-class eco-adventure owned and operated by industry leaders. Soar with the oldest and largest hot air balloon company in Western North Carolina. Float across the Hominy Valley as you stand in awe viewing the Blue Ridge and Smoky Mountains. What passengers say: �Amazing! Thrilling Ride! Great Pilot and Crew!� Bring your camera! Don�t miss this photo opportunity. 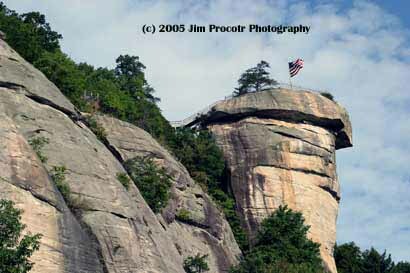 Hiking in Chimney Rock State Park Whether you want a forest stroll to the bottom of The Hickory Nut Falls or you�re a serious hiker, plan your day to hike the trails where movie classic, �The Last of The Mohicans� was filmed. The incredible natural chimney, rock outcroppings, waterfalls, and trails in this now North Carolina State Park are amazingly beautiful and just happen to be a perfect place to spend a day. If you are not a hiker, ride the elevator up to the Chimney for amazing views. Only one mile from Pine Gables Cabins. Click Here to view live WebCam! Boat rentals and guided boat tours offered by Lake Lure Tours. And the Lake Lure Adventure Company offers boat rentals, waterskiing, wakeboarding / wakesurfing and many more watersports adventures. Bring the whole family for a day of fun in the sun on Lake Lure! Scenic horseback riding on mountain trails. Swim with your horse across a mountain river. Ride, fish, and camp in a 2-night packing trip. Pony rides for children. Call 866/206-0235 for details. 2 Championship golf courses and one nine hole municipal nine-hole golf course. Golf like you've never seen it before! And just an hour away, The Biltmore Estate is a perfect day trip during your stay. Enjoy your trip back in time, touring the house, gardens and winery. Take a tour of local produce and crafts farms and stores. You can learn about hiking and camping in the mountains with interactive programs and fun events at the Cradle of Forestry in the Pisgah National Forest. Our favorite event is BUG DAY. Less than an hour's drive from Lake Lure, this is a fun and educational day trip. Tennis courts and playgrounds near the Lake Lure Marina and only a short walk from our cabins! Downtown Hendersonville: Located just 18 miles from Pine Gables, the historic district of Hendersonville offers delights in food, dining and plenty of shopping for everyone. Take the stroll and join the fun of the Summertime Monday�s and Friday�s street music and dances with live music and vendors. The annual NC Apple Festival is held on Labor Day Weekend. Visit the Mineral Museum, Thomas Wolfe�s Angel, and more! Want a great walk or mountain bike trails to see a variety of waterfalls, try Dupont State Forest. For other waterfall hikes click here. Whatever you choose from all the many activities, have a great day adventuring in the area, and then come home to your cabin and relax � savoring the memories you've made in the mountains. Link for more information about Lake lure: Welcome To Lake Lure! � Copyright 1997 to 2010 by Jim Proctor. All Rights Reserved. No portion of this site, including this home page and any of the separate pages, may be copied, retransmitted, reposted, duplicated or otherwise used without the express written permission of the copyright owner.